Get a dog and there goes the garden. That’s what many homeowners conclude, but it doesn’t have to be that way. Dog owner Bud Stuckey and his wife, Maxine McClellan, have been breeding champion American cocker spaniels for 14 years. His home garden in Felton, California, provides a safe, comfortable environment for the dogs as well as an attractive space for plants and people. The best way to accomplish both goals is to design your garden to meet your dog’s needs, Stuckey advises. That way, Fido will be able to romp and race without injuring himself or trampling your flowers―well, most of the time, anyway. Owning a dog also means giving up perfectionism and learning forgiveness, says Stuckey. If you were a dog, what would you want? Each breed has a different personality. The better you can accommodate its particular traits, the happier your dog. And the happier your dog, the better your chance of maintaining a garden you’ll both enjoy. This dog-friendly yard includes a running track, border control, comfy mulch, sensible plants, and a piece of driftwood to serve as a marking post. Gentle hardscape: Smooth flagstones set in pebbles form a dry creek bed dogs can comfortably tread. Comfy mulch: Small cedar chips are easy on paws yet large enough so they won’t cling to silky coats. Border control: Pieces of driftwood persuade dogs to stay away from planted areas. Running track: A long, winding path provides dogs with plenty of exercise. Sensible plants: Plants near paths should have soft foliage but be sturdy enough to stand canine rough-housing. Marking post: A sculptural piece of driftwood gives Toby, a male cocker spaniel, a suitable spot to mark his territory. Dogs need exercise; paths give them a designated space to do it as well as a venue to perform their perceived job―to patrol your property line and keep out intruders. Readers suggested sacrificing a few feet along the fence for a perimeter path to simultaneously satisfy both needs. If your dogs have already created their own paths through the garden, don’t try to redirect them. Instead, turn their well-worn routes into proper pathways. A 3-foot-wide clearance is sufficient for most canines. Plant a screen to hide this dog run if you like; pets seem to like having their own “secret garden.” If you have a Houdini and need to keep your escape artist from tunneling under the fence, you may need to install an underground barrier made of rebar, chicken wire, or poured concrete. 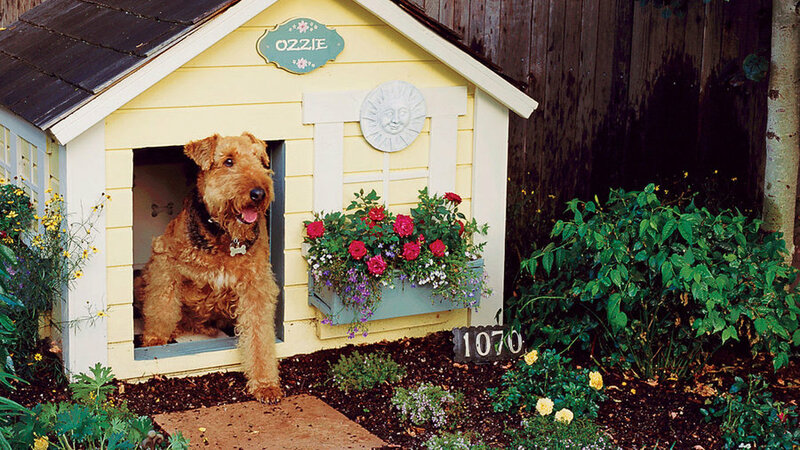 Your dog needs a spot to relieve himself, but it doesn’t have to be your lawn or flower bed. Set aside a corner of your yard as a toilet area, and train your pet to eliminate there and nowhere else. This learning process may take a puppy about three weeks and an adult dog longer. Consult a dog-training manual for instructions. Cover the designated area with material Fido will accept and that you can clean easily. Flagstone, pea gravel, bricks, and cedar chips are all good choices. If you have a male dog, consider adding a marking post so he can define his territory (Stuckey set up a driftwood stump). Like humans, dogs enjoy basking in the sun. So by all means, give them a deck or a patch of lawn for sunbathing. But remember that dogs can overheat easily, so it’s even more important to provide them with cooling retreats. Here, 4 retrievers (liko, Lexi, Andy, and Morgan) enjoy resting under an arbor in Oceanside, CA. Like humans, dogs enjoy basking in the sun. So by all means, give them a deck or a patch of lawn for sunbathing. But remember that dogs can overheat easily, so it’s even more important to provide them with cooling retreats. They’ll happily share arbors, pergolas, and other shade structures with their owners. But most dogs seem to appreciate having a shelter of their own, such as a doghouse. If you plant landscaped areas densely, dogs will stay out, our readers say. Still, most dog owners recommend additional precautions: Plant in raised beds or on mounds, and start with 1-gallon or larger plants. Put up temporary fencing around newly landscaped areas; when you remove it, add a rock border or low fencing as a reminder to stay out. Plant romp-proof shrubs and perennials like ornamental grasses around the edge of the garden. Put brittle plants like in the center, where they’ll be protected. Avoid thorny and spiny plants, which can cause serious eye injuries. Be very cautious about growing poisonous plants, like castor bean or hellebore, in readily accessible areas. Visit for a complete list. Many wild mushrooms produce afla-toxins, which can be fatal if ingested by dogs; if mushrooms appear, dig and dispose of them immediately. Your compost pile should be off-limits for the same reason. Weeds can be dangerous, especially foxtail grasses with barbed seed heads, which dogs can accidentally inhale with serious consequences.